Call it a burst of activity between naps: the New Horizons team woke its Pluto-bound spacecraft from hibernation this week for some onboard housekeeping. On pre-programmed commands from controllers at the Johns Hopkins University Applied Physics Laboratory in Laurel, Md. – transmitted to the spacecraft in August through NASA’s Deep Space Network of antenna stations – New Horizons came out of hibernation on Nov. 9. The spacecraft had been “sleeping” since Aug. 27, when it completed its third annual instrument and system checkout. Aside from turning the spacecraft’s antenna, operators will also upload some tweaks to New Horizons’ fault-protection software. The team puts the spacecraft back into hibernation on Nov. 20. 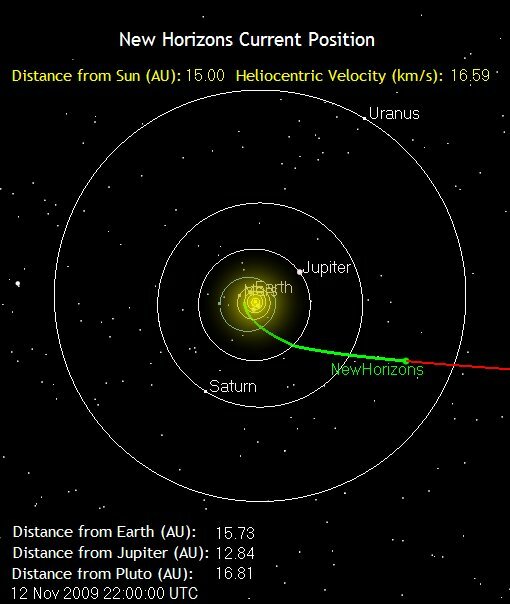 Distance milestone: Late tonight, New Horizons will reach 15 astronomical units from the Sun – the equivalent of 15 times the distance from Earth to the Sun. 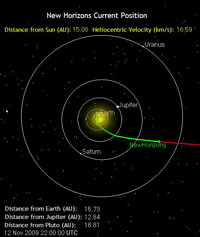 Cruising between the orbits of Saturn and Uranus, the spacecraft is speeding toward Pluto at 37,110 miles (nearly 60,000 kilometers) per hour.